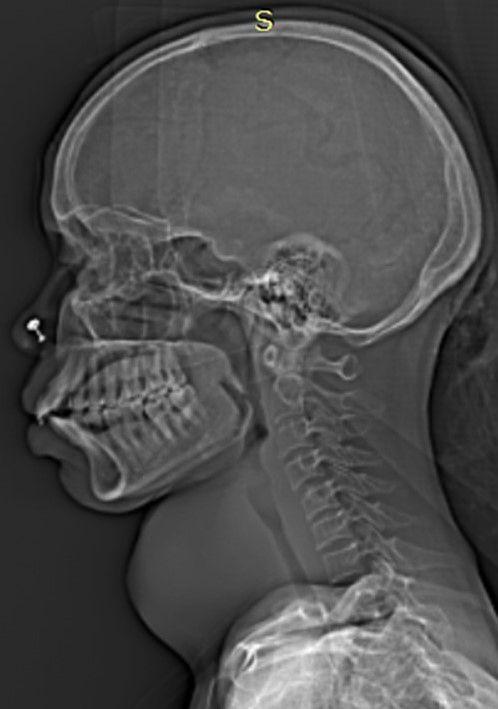 A 60-year-old female presented to the ENT department of our hospital with a complaint of progressive neck swelling of three months’ duration and a shorter duration of dysphagia, neck pain, and mild breathing difficulty. Thyroid function test results were unremarkable. Ultrasound neck done elsewhere showed a large cystic lesion in the thyroid with no increased vascularity on color Doppler. 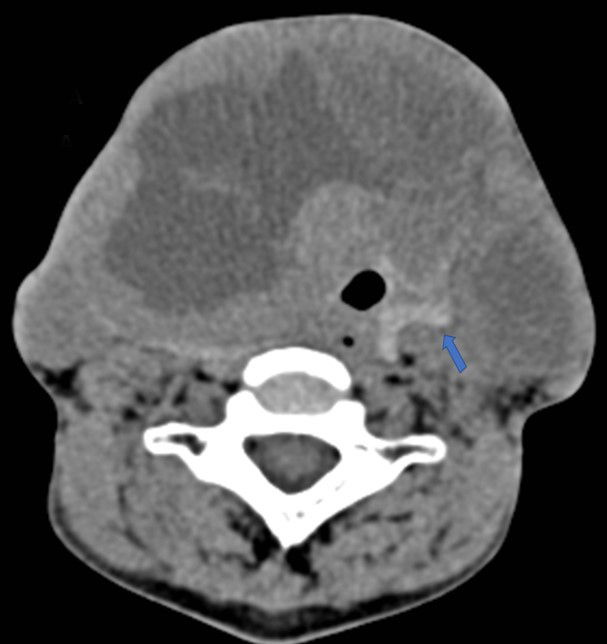 A CT scan of the neck revealed a large, well-defined, slightly lobulated soft-tissue heterogeneous mass arising from the right lobe, isthmus, and part of the left lobe of the thyroid gland with no micro- or macrocalcifications (Figure 1). The lesion was hypoenhancing, predominantly of low attenuation and well delineated from the peripheral normal enhancing residual thyroid parenchyma (Figures 2, 3). The mass was seen infiltrating the strap muscles and the subcutaneous soft-tissue plane. 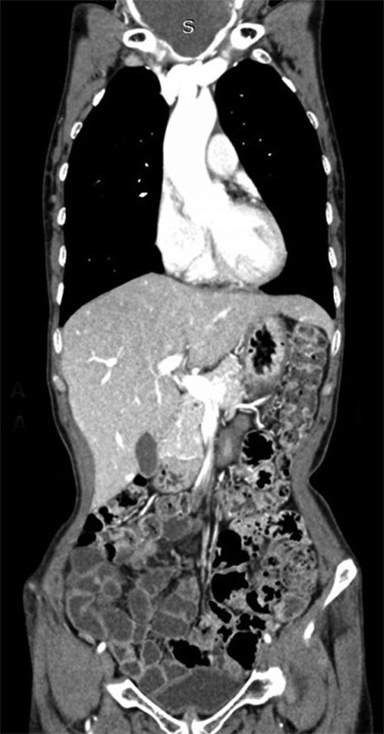 Inferiorly, the lesion extended retrosternally into the superior mediastinum (Figures 4, 5). 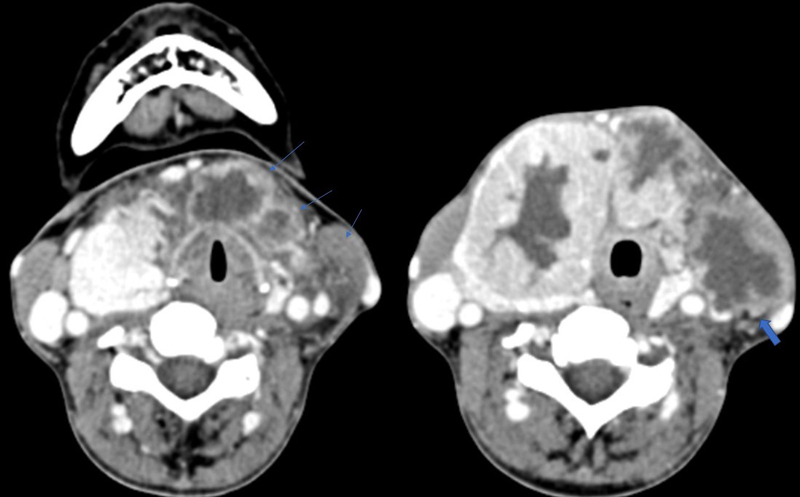 Also seen were multiple heterogeneously enhancing level II, III, and IV cervical lymph nodes (Figure 6), with the most significant measuring 3 × 3.7 cm on the left side. 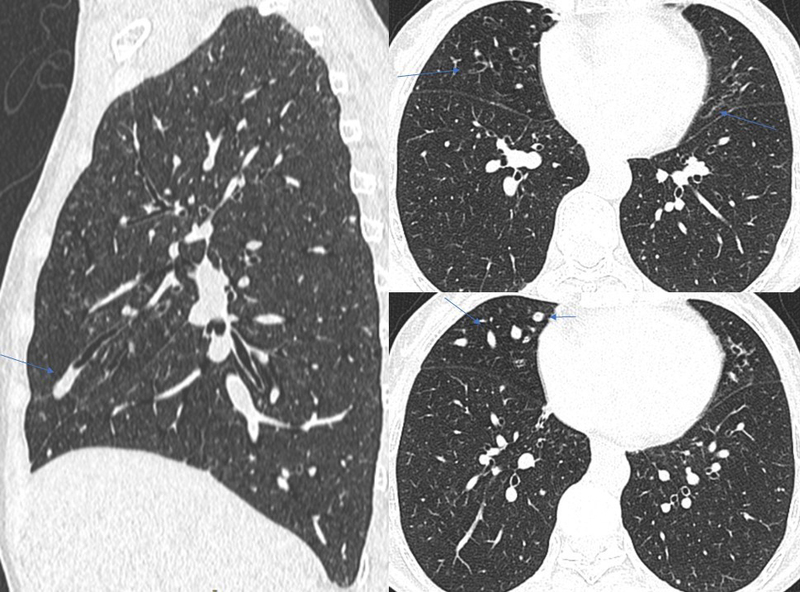 A chest CT scan performed as part of additional workup revealed multiple subcentimetric, soft tissue, nodular densities scattered in bilateral lung fields (Figures 7, 8), with a few showing the feeding-vessel sign. Incidentally noted was cylindrical bronchiectasis with mucus plug impaction in the right middle lobe and lingular left upper lobe segment (Figure 9). No significant mediastinal lymphadenopathy was noted (Figure 10). 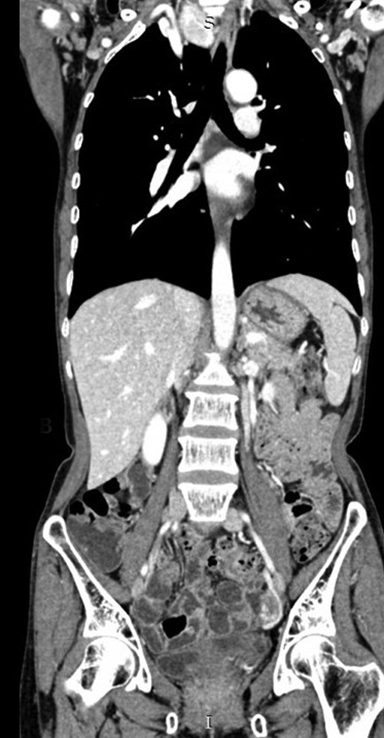 A contrast-enhanced CT scan of the abdomen for metastasis was unremarkable. In our case, the patient showed progressive dyspnoea and dysphagia on follow-up. 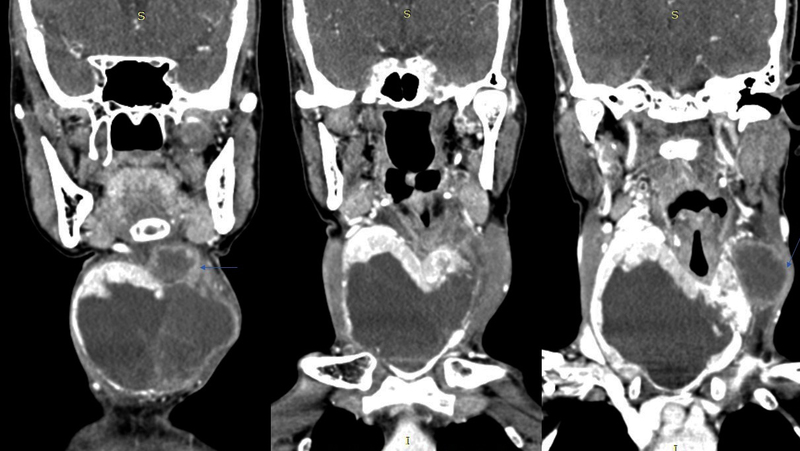 An FNAC of the thyroid lesion revealed squamous cell carcinoma. Thyroid cancer is the most common endocrine malignancy and is the seventh-most common cancer in women. Typically, these malignancies arise from the normal thyroid tissues and are of papillary, follicular, or medullary histology.1 Primary squamous cell carcinoma (SCC) of the thyroid is a sporadic malignant disease because the thyroid lacks squamous cells. The disease is almost always fatal. Fewer than 100 cases have been reported in the literature;2 it represents <1% of all primary carcinomas of the thyroid gland.3,4 Overall survival usually does not exceed 6 months’ post-diagnosis. In our case, there was progressive tracheal compression on short-term follow-up. Squamous cell carcinoma of the thyroid is an extremely rare, aggressive, and highly lethal neoplasm. Though primary SCTC may coexist with papillary and anaplastic thyroid cancer, pure SCTC, occurring solitarily without other tumors, is extremely rare. 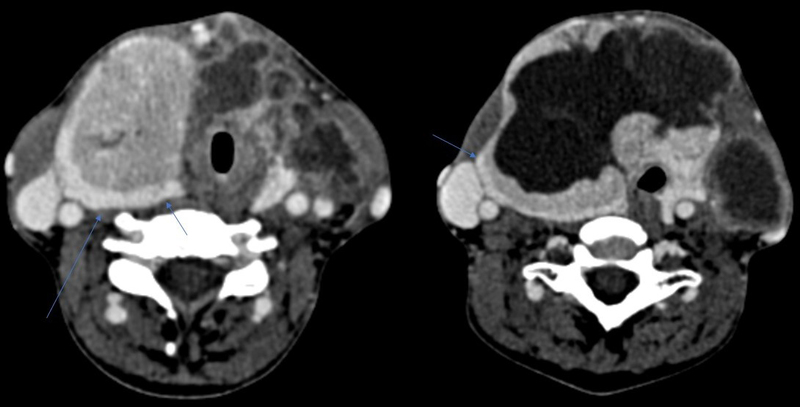 Computed tomography plays an important role in detection and characterization of the lesion, extrathyroid invasion, and metastases. Kuczmarska A, Patel MD, Mehta N. Primary squamous cell carcinoma of the thyroid. J Cancer Biol Res. 2014; 2(2):1051. Shenoy VS, Rao RA, Kamath PM, et al. 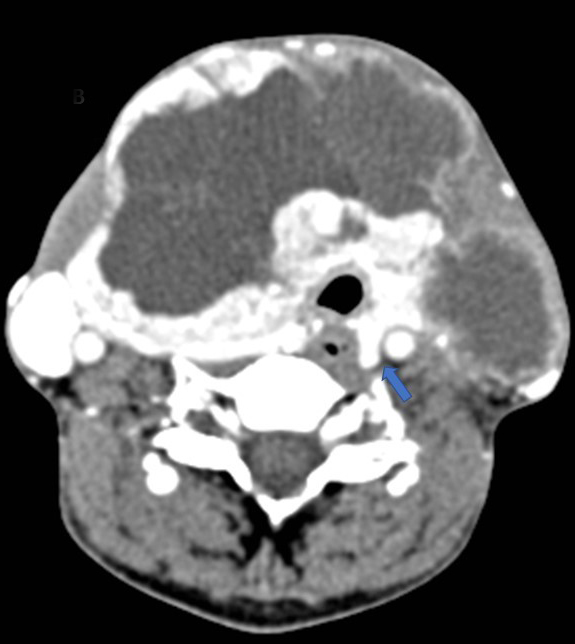 Primary squamous cell carcinoma of thyroid – a rare malignant goitre. Indian J Surg Oncol. 2016 Dec;7(4):467-469. K, Anastasiadis I, Panteli N, et al. Primary squamous cell carcinoma of the thyroid gland. Journal of Surgical Case Reports. 2014;12:1–3. doi: 10.1093/jscr/rju133. Wygoda A, Rutkowski T, Szcześniak-Kłusek B, et al, Primary squamous-cell thyroid carcinoma – a successful treatment with five-year follow-up. Endokrynol Pol. 2017;68 (5): 592–596. Syed MI, Stewart M, Syed S, Dahill S, et al. Squamous cell carcinoma of the thyroid gland: primary or secondary disease? The Journal of Laryngology & Otology. 2011; 125:3–9. Goldberg HM, Harrey P. Squamous cell cysts of the thyroid with special reference to the etiology of squamous epithelium in the human thyroid. Br J Surg. 1956; 43:565–9. Chaudhary RK, Barnes EL, Myers EN. Squamous cell carcinoma arising in Hashimoto’s thyroiditis. Head Neck. 1994;16: 582–585. Kebapci N, Efe B, Kabukcuoglu S, et al. Diffuse sclerosing variant of papillary thyroid carcinoma with papillary squamous cell carcinoma. J Endocr Invest. 2002; 25:730–734. Cho JK, Woo SH, Park J, et al. Primary squamous cell carcinomas in the thyroid gland: an individual participant data meta-analysis. Cancer Med. 2014;3(5):1396-1403. Chauhan A, Sarawagi R, Kumar A, Malik R. Squamous cell carcinoma of the thyroid with lymph nodal and pulmonary metastases. Appl Radiol. 2018;47(12):22-27. Prepared by Dr. Chauhan while an Assistant Professor of Radiodiagnosis; Dr. Sarawagi while an Associate Professor and Radiologist; Dr. Kumar while an Assistant Professor and Interventional Radiologist, and Dr. Malik while Head of Department of Radiodiagnosis, All India Institute of Medical Sciences, Bhopal, India.